When it comes to the ultra-talented McClelland Barclay, there may be no other artist recognized as an early 20th century American illustrator whose work touches so many areas of collecting. In addition to his illustrations for varied advertisements, magazines, war effort posters, and calendars, he also designed bowls, boxes, trays, bookends, desk accessories, wall hangings, and even pieces of costume jewelry that are highly regarded by today’s collectors. After a very successful run as an artist prior to his enlistment in the navy during World War II, Barclay lost his life at the age of 51 aboard a landing craft torpedoed by a Japanese vessel in the Pacific theatre. The United States most certainly lost a brave and talented serviceman at that time, but his name and his art live on as collectors continue to pay tribute to this talented man. Many collectors of militaria know Barclay for his work illustrating World War II notables like Generals Eisenhower and McArthur. The stories of how he dressed fellow servicemen in garb to emulate these famous men so he could paint them are quite entertaining. Collectors also seek the posters he illustrated supporting recruitment slogans, anti-propaganda messages, and other World War II-related imagery. Other folks recognize magazine covers by Barclay that appeared on many periodicals in the 1930s and early ‘40s including The Saturday Evening Post, Ladies Home Journal and Pictorial Review among others. These often feature pretty women in poses popular during that era, as do the advertising calendars he’s know for like the one illustrating this article. Barclay also did some very famous illustrations for Ford Motor Company’s “Body by Fischer” campaign. An original 1920s oil painting of these renderings can be worth thousands today when offered to an avid collector of Barclay’s work or a collector of automobile memorabilia. Those wanting a Barclay illustration from the Ford campaign at a more affordable price can often locate magazine advertisements torn from periodicals and sold individually, especially at book and paper shows. For $25 or less you can purchase an ad originally featured in a 1928 issue of Country Gentleman depicting a stylish couple along with the Fisher logo. What many people don’t realize about this notable artist is that he designed many other items that were distributed by the McClelland Barclay Art Company in the 1930s. These utilitarian and decorative household objects were manufactured of metal and included bowls, boxes, trays, bookends, desk accessories, and wall hangings. Through these cast pieces, Barclay exhibited his talent as a sculptor. While some of the simpler items like leaf shaped bowls and flower shaped pin dishes can still be found for quite reasonable prices, his more elaborate designs, especially those featuring animal sculptures, usually bring $200 and up, especially when sold at auctions where the work of great American illustrators is featured. 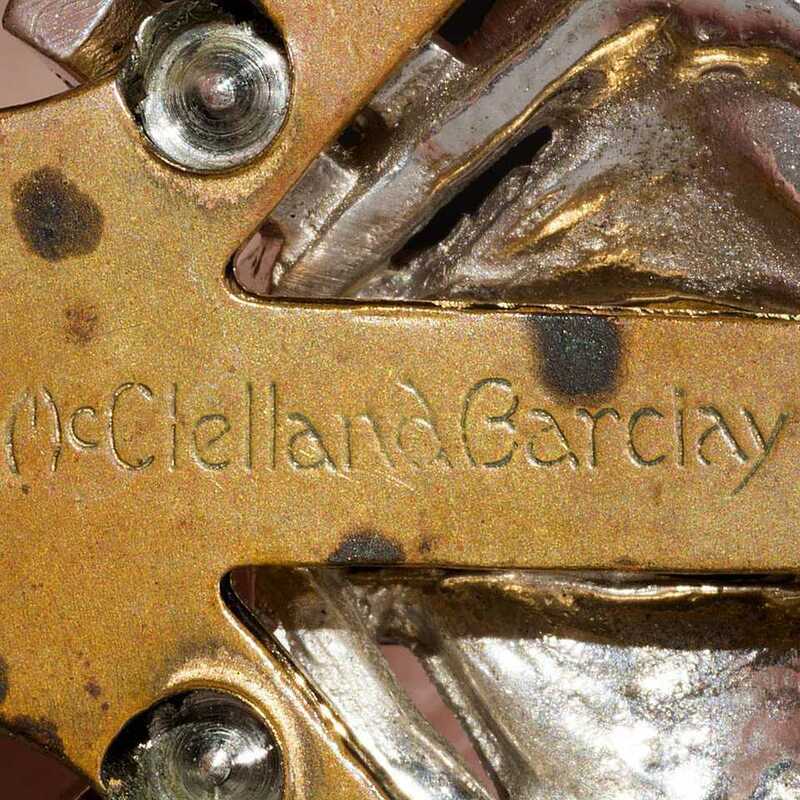 Another lesser-known product of Barclay’s design skill is the jewelry bearing his name. Most of the rhinestone costume jewelry he produced was made during the 1930s with a very distinctive Art Deco look. He also produced intricately designed sterling silver jewelry in the early 1940s, which can be even harder to locate than the rhinestone pieces. Today collectors seek both types of jewelry, but usually prefer one over the other. Rhinestone pins can be purchased in the $75-$150 range while necklaces and bracelets usually sell for more than $150 apiece. Sterling silver jewelry items with the McClelland Barclay mark usually sell for $150-300 each, or more, when they come up for sale.